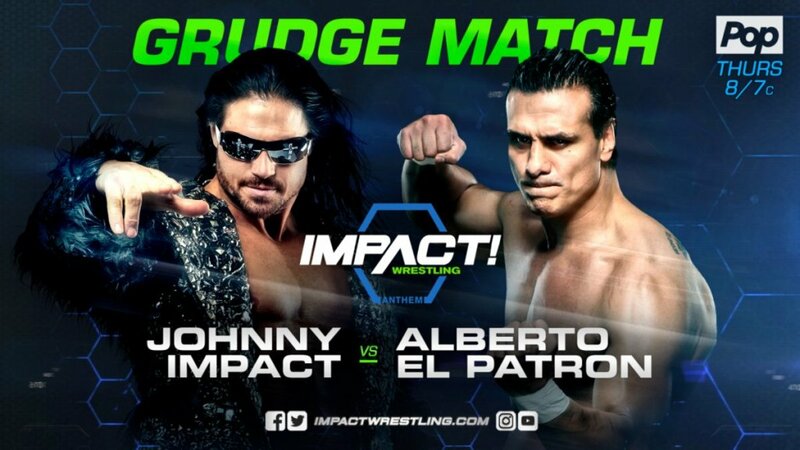 Tonight: Johnny Impact faces Alberto El Patron in a grudge match. This was the first of two triple threat matches where the winners of each will advance to compete for the vacant Knockouts Championship. Van Ness snapped and took over after Spinelli put on her fur coat. Spinelli got Van Ness up in the electric chair and dropped her on Rayne, but Van Ness hit the Unprettier on Spinelli for the win. Zane was in control early before Ishimori quickly took over. Zane regained the advantage until Ishimori made a comeback and won with the 450 splash. Caleb Konley and Trevor Lee jumped Ishimori after the match and beat him down. - In the back, James Storm promised to defeat Texano tonight. He then said he was coming after Dan Lambert and American Top Team next. - At the LAX clubhouse, Konnan said he wants the Tag Team titles back and promised to take the fight to the streets. Callihan buried Myers under a pile of chairs. They traded vicious shots at the center of the ring, then Callihan won the match with a lariat. - Backstage, KM attacked a bunch of guys to prove his worth to American Top Team. Before the match, Lambert, Bobby Lashley, and ATT arrived backstage. KM asked if they saw what he did, but Lambert didn’t care and said they have a cowboy to take care of. Storm was in control early until Texano spit Storm’s own beer in his face. Texano nailed Storm with a superkick and put on Storm’s hat. Texano turned around and Storm hit the Last Call superkick for the win. After the match, ATT ran out and jumped Storm. They beat him down until Moose ran out for the save with a chair. Lambert challenged Storm and Moose to face Lashley and himself next week. ATT were shocked that Lambert named himself Lashley’s partner. - A commercial aired for Park, Park, and Park Attorneys at Law. Joseph Park introduced his cousin Chandler Park (Ethan Page). Joe was in control after sending Angle into the steps. Angle was busted open and bled all over the ring. Joe scored a very close near fall with a Muscle Buster before Angle made a comeback and hit the Angle Slam for a two count. Angle locked on the ankle lock, but Joe countered into the Coquina Clutch. Angle locked the ankle lock back on for the win. - Backstage, Eli Drake promised he’d be watching the main event tonight. He had a brief interaction with Jimmy Jacobs. Ethan Carter III joined Jeremy Borash and Josh Mathews on commentary. Sydal was in control early, then Dux took over. Dux scored a close near fall with a DDT. Sydal ended up winning the match with the double knees and Shooting Star Press. They brawled at the center of the ring to start the match, leading to El Patron taking over after a kick to the head. During the commercial break, El Patron gave Impact a double foot stomp when he was under the steps. El Patron scored a very close near fall with a superkick. He scored another one with a reverse superplex and used a low blow but only got a two count. Eli Drake came out and yelled at El Patron. El Patron attacked Drake and hit him with the belt. This gave Impact the chance to take over and hit Starship Pain for the win. Post-match, Drake hit El Patron with the belt. Drake and Chris Adonis then beat down Impact. Petey Williams ran out for the save and gave Drake the Canadian Destroyer. Next Week: Dan Lambert & Bobby Lashley take on Moose & James Storm. Plus, Impact Grand Champion Ethan Carter III defends against Matt Sydal.